If “you are what you love,” then I guess I’m beer, salsa con queso, and Ra bbit Fur Coat. The record, which just turned 10 years old, was released in January 2006 and features some of my favorite musicians. In addition to the wonderful Jenny Lewis of Rilo Kiley and the indie-country duo The Watson Twins, Conor Oberst (of Bright Eyes), Ben Gibbard (of Death Cab for Cutie), and M. Ward all appear on the remastered album. And on a cover of the Traveling Wilburys “Handle With Care” no less. 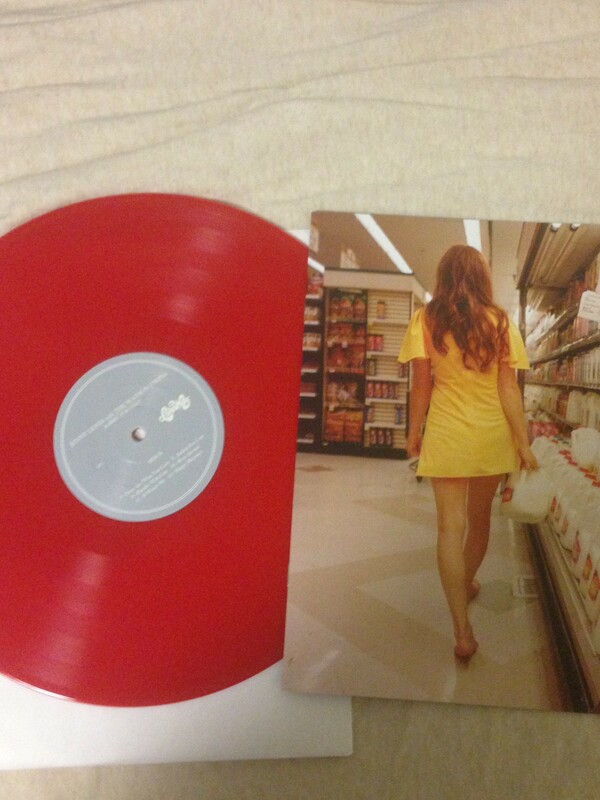 This rerelease comes on red vinyl (the same hue as the dress Jenny Lewis is wearing on the cover) and has been remastered for its anniversary. So, after eating some chips and queso, drinking a beer, I’m going to go through each song, one by one. I suggest you listen along while reading this. Enjoy. “Run Devil Run” – The three-part harmony of this song, repeating the title over and over, gives a preview to the minimalistic approach to the album. Less is more. The song is mostly acapella, with a little acoustic guitar being strummed very softly in the background if you listen carefully. It’s a somber, slow intro to Rabbit Fur Coat, but “Run Devil Run” serves to exorcise the demons, and clear the path for the rest of the album. “The Big Guns” – “I’ve won hundreds at the track, but I’m not betting on the afterlife.” This questioning of religion is something Lewis really explores a fair amount, especially later throughout the album. This upbeat instrumental, with its driving acoustic guitar and pounding drums, fits nicely with Lewis’ and the Watsons’ harmony in the chorus. “Why am I always messing with the big guns?” is a blanket statement we can all relate to. Why am I doing this? Why am I trying to do something I can’t? It’s a short, but powerful song about being powerless. “Happy” – “I’d rather be lonely, I’d rather be free.” “Happy” is a country/folk-inspired song. It encompasses the idea of wanting solitude, and the freedoms that presents, but still being drawn to someone who could make you happy. Just a simple acoustic guitar accompanying the first verse and chorus, with a subtle electric guitar coming in during the second (and my favorite) verse until distorting and feeding back until the end. Like Lewis says, we all “worry about cancer and living right,” these days. “The Charging Sky” – This brings us back not only to the questioning of a higher power from “The Big Guns,” but the questioning of lots of things like government, and other groups. “It’s a surefire bet I’m gonna die, so I’m taking up praying on Sunday nights,” is a great way to address the existential fears we all feel. It’s a rather serious topic for a swinging country-folk song. However, sometimes all we can do is “share with our friends a couple of beers, in the belly of the beast.” We’re only human. “You Are What You Love” – With the drums like a march, this song is a declaration of an ideology. “You are what you love, and not what loves you back” are words to live by. Lewis sings about insecurities in a relationship, and not wanting to be “yours for the taking.” She calls herself a “coward” and “fraudulent,” trying to persuade the person who loves her not to. It’s an illusion, a front, not to allow oneself to be potentially hurt by someone. But, at the end of the day, you’re on that person’s “doorstep, pleading for you to take me back.” This vulnerable track exposes Lewis’ self-doubt and somewhat destructive nature on the pursuit of happiness. So, there you go, all twelve songs of Rabbit Fur Coat. It’s been ten years since its release and it still holds up today. Love, loss, existential/religious crisis, and our search for happiness despite ourselves getting in the way all addressed and wrapped up in a beautiful red vinyl record for us to enjoy again and again. Jenny Lewis and the Watson Twins are doing a couple shows to celebrate the anniversary of Rabbit Fur Coat, so let’s hope that their playing together again will inspire another record. If not, we’ll always have our Rabbit Fur Coat to keep us warm.